Join us this summer in D.C. to learn how to use journalistic writing techniques in your Advanced Placement English Language and Composition and journalism classes. You will learn from Washington Post writers and successful IJW educators, visit historic and literary places and create new lesson plans for your students. Since 1988, the Intensive Journalistic Writing Institute (IJWI) has trained hundreds of English and journalism teachers around the country in new approaches to teaching writing and using examples of contemporary and classic journalistic models. Upon completion of the course, you will be able to offer AP English Language & Composition at the junior or senior level. (This Institute will not prepare you for a newspaper production class.) High schools give English, composition, fine arts or technical writing credit for courses using the IJWI approach. The lead teacher and director is Carol Lange, one of 15 educators in the first Intensive Journalistic Writing Institute that created the IJW approach and foundation curriculum. 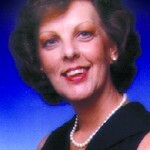 Carol has been teaching with the Institute since it began under the auspices of the Dow Jones News Fund (DJNF) in 1988. 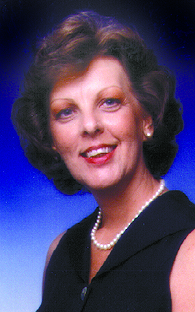 Lange was the 1991 DJNF National High School Journalism Teacher of the Year and a JEA Carl Towley recipient. Alan Weintraut and Valerie Kibler, both previous DJNF Journalism Teachers of the Year and IJWI participants who began successful IJW-approach classes, will join Carol to form the core teaching staff. English Department chair, journalism and AP English Language and Composition teacher and A-Blast print and online adviser, Alan Weintraut has taught at Annandale (Va.) High School since 1994. Alan joined Carol in 2010 to write a journalism curriculum that was translated into Chinese; they trained teachers and students in Gansu Province, China, to begin journalism programs in five large schools. Alan returned with some of his A-Blast staff the following summer to train teachers and students in an additional eight schools. Valerie Kibler teaches Advanced Placement English Language and Composition and journalism and advises the newspaper and online news at Harrisonburg (Va.) High School. Valerie is the Virginia JEA state director. Other educators who have successfully incorporated journalism in the English classroom will share lesson plans. These include Rebecca “Becky” Sipos and Alex Kaplan. Guest lecturers from The Washington Post will provide additional perspectives on journalistic writing. 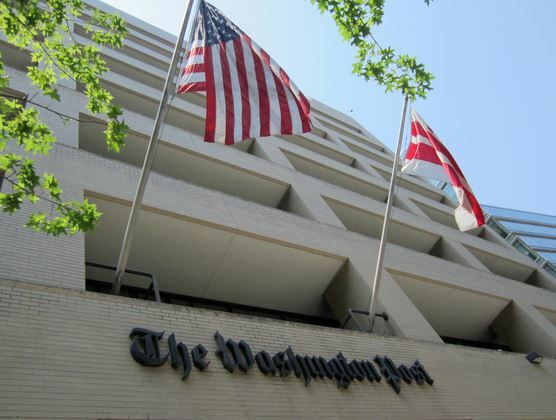 The Washington Post will host the 2014 IJWI. 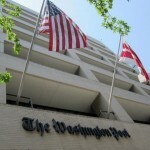 IJWI will be held at The Washington Post headquarters. Located near the White House, The Post provides a comfortable meeting place with all the amenities we need. 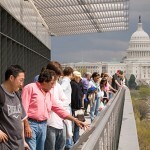 Off-site seminars will be held at the Newseum and the National Archives. These will highlight the resources available to add depth to your journalism and AP courses. The 2014 IJWI begins at 2 p.m. on Sunday, June 29. The last session will conclude at 4 p.m. on Saturday, July 5. The fee for the seven-day Institute is $400 per person. Institute participants will receive the IJW Notebook, an IJWI feature full of handouts and resources for classroom use. The District will be an active participant in the Institute — giving historic perspective, inviting all to explore its many dimensions and offering an enriching environment for learning. Environmental journalists — the Mall and other green spaces provide breathing spaces. Political reporters — the Capitol, White House, and K Street lobbyists are all here. Food critics — visit international cuisine in Adams Morgan and at the Smithsonian Folklife Festival, soul food on U Street, food trucks near McPherson Square and an array of other possibilities in every price range. Technology, education and sports reporters — you have your venues to explore in D.C. as well. 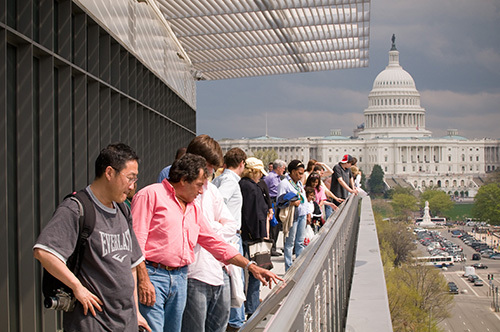 Visitors to the Newseum enjoy the view from the Hank Greenspun Terrace. Our group picture will be taken here. Capitol Hill, museums, art galleries and nearby environs will be woven into the IJWI experience. 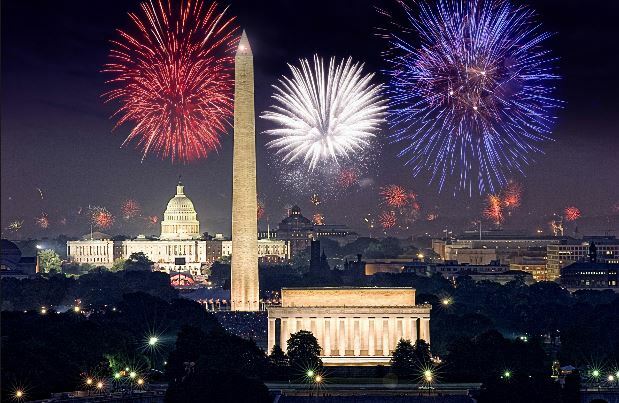 D.C. is an easily accessed city with Reagan National, Dulles International and BWI airports. Amtrak and main routes — I-66 from the west, I-95 from the north and south —and many other approaches. You’ll get to know the Metro and pedestrian routes. Participants may find their own lodging or commute from home. We have arranged for rooms at the Arlington Court Suites Hotel. We have secured a rate of $129.00 per night. The tax is 13% per night which brings the total per night to $145.77. The rate includes daily complimentary hot buffet breakfast with a view of D.C., wireless and dial-up Internet access, and 24-hour access to Fitness and Business centers. On Monday through Wednesday, guests can return for a complimentary light dinner and on Thursday a complimentary dessert is available. Call group sales at the Arlington Court Suites before May 24, 2012, to reserve your room at the discounted rate: (703) 524-4000. Be sure to say you are an IJWI attendee. 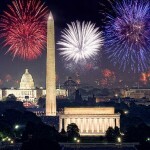 Participants will be able to attend the fabulous Fourth of July festivities and explore the area. The IJWI fee is $400. The registration deadline to take the institute is May 16. This registration form for the Institute must be accompanied with a deposit of $200 made payable to Intensive Journalistic Writing Institute. Final payment must be made by June 10. If cancellation takes place five or fewer days before June 29, IJWI does not allow a refund. IJWI begins at 2:00 p.m. on Sunday, June 29, and ends on Saturday, July 5, at 4:00 p.m. For more information about opening and closing days contact Carol Lange at LangeJour@aol.com. IJWI has been offered in the past for two or three academic credits. If sufficient registered participants indicate interest, we will seek academic credit.